Hard to imagine though it may be, there used to be a time when nobody was looking forward to a new Planet of the Apes movie. I suppose the negative reaction to Tim Burton’s 2001 remake of the classic film series gave audiences little hope for its future, so when a new reboot series was announced there was hardly anyone who thought it would be worth anybody’s time. Time, of course, prove everyone to be wrong, as Rise of the Planet of the Apes was a relieving surprise that introduced the world to Andy Serkis’ Caesar, a phenomenal motion-capture creation that to this day represents the very best that the industry has to offer. It turned out to be even better with the follow-up Dawn of the Planet of the Apes, which continued the story down a deliciously bleaker path and chronicled the titular world in the days before Charlton Heston ever stepped onto it in the 1968 original. Now, it all comes full circle in the last in this breath-taking trilogy, and undoubtedly the best as these movies not only get better and better with every film, but they also find more and more ways at showcasing powerful drama and excellent cinema with this fantastical set-up, more so than even any of the beloved originals. In other words, it takes a lot of talent to make not one but three compelling and emotional movies about talking apes, but they have more than pulled it off. War for the Planet of the Apes once again finds ape leader Caesar (Serkis) in a vicious battle against humans, in a final assault to wipe out his kind and reclaim the fallen world around them. After suffering a tragic loss at the hands of the vicious Colonel (Woody Harrelson), Caesar sets out to find and exact vengeance on what little remains of mankind, only to find himself more in a battle for his own soul and morality than actual physical conflict (that would be where the titular war comes in, as there is little proper warfare in the film aside from some select moments). Like the other two films before it, it’s a fairly simple plot but it allows for so much character development and haunting visuals of ape and human slaughter it tends to be the very best kind of overwhelming, as well as a fascinating lead character you can easily get behind. 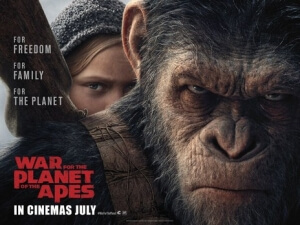 Caesar, from the very beginning, has been a fantastic character to get behind, but this is perhaps the deepest and most soulful interpretation that Serkis has yet portrayed as the film allows us to both see his own inner turmoil, complete with hallucinations of the previous film’s scary villain ape Koba, and become concerned and even frightened at the lengths he is willing to go to in order to secure his clan’s future. Over all of these films, Serkis has given exceptional performances and has continuously brought up the argument over whether or not to honour actors that perform via mo-cap; here, there’s no question that Serkis needs to be at the very least nominated for his truly outstanding work here, as does Harrelson who has honestly never been more terrifying in the surprisingly few scenes that he has. Much has been made about this series’ incredible use of visual effects, Caesar notwithstanding, and while they were fantastic in Rise and even better in Dawn, here the apes and how they are rendered and performed, you cannot convince me that those weren’t actually real apes that they trained and somehow got to speak. This is the most real that any motion-capture characters have looked, and the team at Weta Digital that put it all together needs to be seriously awarded with all the Oscars, like right now; everything from the faces to the hair on their skin looks like it was practically crafted and shown right there in front of the camera, even though we all know it’s just a bunch of actors in silly pajamas. While I sadly doubt that Serkis will actually be honoured for his truly outstanding work here, a Visual Effects nomination – and possibly even a win – feels almost certain by this point. In terms of its story, this rebooted series has never felt more cinematic; it has beautiful cinematography, as well as stern and steady direction by Matt Reeves, both of which ensure that every major action scene and even the smallest of character moments feel absolutely epic, giving it the proper satisfying conclusion that this trilogy undoubtedly deserves. Even the comic relief, represented in Steve Zahn’s hairless former zoo chimpanzee known as Bad Ape, could have gone so wrong in lesser hands, almost to Jar Jar Binks levels, but here it really works and his is a character you can not only legitimately laugh at and with, but also connect with him on a personal level like you can a lot of the other ape characters in this film. Hell, there’s even a scene of apes literally throwing poo around and it still works unbelievably well within the established tone, probably because by this point they’ve earned it. A deep, dark and devilishly stunning movie both on its own and as the conclusion to a consistently fantastic trilogy, War for the Planet of the Apes is everything you could have hoped for in a trilogy-closer, while also giving you perhaps one of the most thematically complex blockbusters in years. Apes together strong, indeed. War for the Planet of the Apes is a magnificent conclusion to the rebooted trilogy, with the story being exceptionally bleak and thematically complex, the filmmaking completely stunning, and some of the finest examples of visual effects that you will see all year, boosted by a truly awards-worthy lead performance by Andy Serkis who has never been better.